Till date when I think of a warm and cosy place.....I am reminded of this room. The excitement of doing up your first home and the memories that go with it.........the endless trips to furniture stores.....hubby cringing every time I brought it up :-) Decorating my son's nursery before his birth. My mom and hubby were my captive helpers......unfortunately for them, I chose to decorate in the middle of the night :-) The joy of bringing my son home from the hospital. The numerous parties with our wonderful friends back in the east coast. Don't you feel that your first home is always the most special, no matter where you go? I seem to be reminiscing a lot today and also rambling a bit.............so will end here :-) Happy almost Friday folks........... and have a great weekend. I am joining Cindy's blog for Show and Tell Friday. Such a beautiful room. I know exactly what you mean. I love my first house so very much. It will always be special in my heart and whenever I’m in NC I drive by to see her. She was a dear friend. gorgeous!!! love the reds and that fireplace you are SO right..its the best!! gorgeous....endless trips to furniture houses is so true..
What a great fireplace! I have fond memories of our first home, also. Tell me more about the wall to the left of the fireplace, please. Found you on Mommy Bloggers Club...love your blog! I well up a bit with your description of your first home. What a lovely fireplace and I can see why you were so drawn to it! 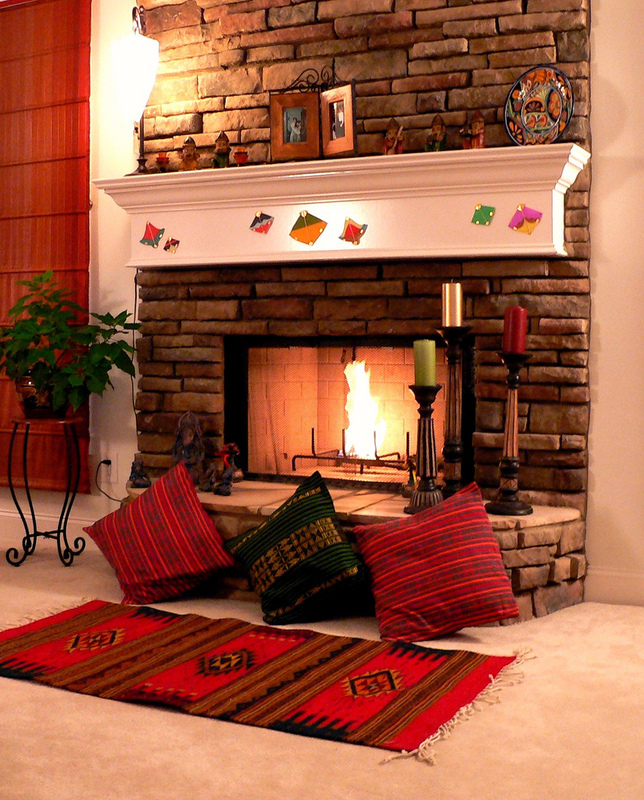 What a beautiful fireplace! I must say that our first house was not our dream house. It was a tiny little rental on a lake that we discovered - midwinter - that it was not insulated! lol! So we wrapped the entire house in visqueen, hung wool blankets over the windows, and stashed our wine bottles in the pile of snow that came in by the front door! lolol! Lots of memories of that little house, and we learned alot of "survival" tips --- but our current farmhouse is much closer to our dreamhouse! Thanks for visiting and following my blog, Anu! I'm following you back and looking forward to getting to know you! Yes,Anu,I think our very first house is very special. There are so many memories attached to it. Yet, strangely enough, I would never want to go back to our original house. Intead, I want to remember the good times and all the love shared there. Both of our "babies" were born while we lived in that first house. Once, I went back and drove by the house and it made me very sad. So today, I just keep it locked in my heart. What a warm and cozy spot!! Beautiful warm and inviting space, love the reds...! !